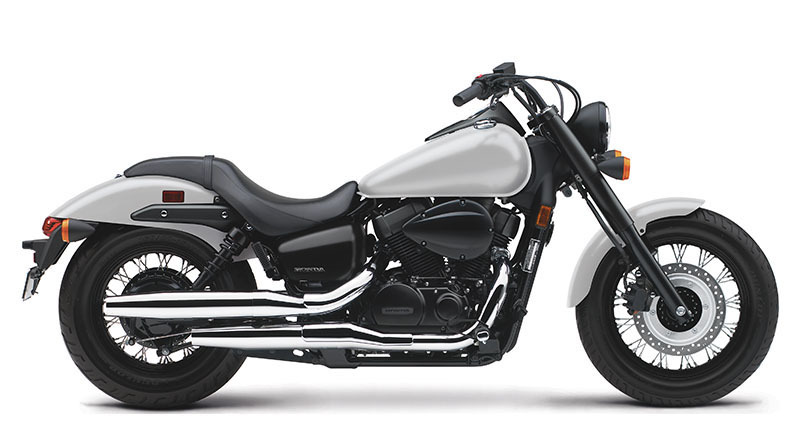 Meet the opposite of pretentious, diamond-encrusted, gold-plated, look-at-me bling: Honda’s Shadow Phantom. Here’s a bike for riders who know that sometimes a whisper is a whole lot louder than a shout. That when you’re confident, you don’t have to peacock around in a costume. With its spoked wheels on black rims, tough front fork, bobbed fenders, and matte black accents, the Phantom makes a powerful statement. But make no mistake, the 745cc V-twin (also blacked-out) and throaty exhaust always makes a big entrance. The Phantom has a slightly upright seating position so it’s equally comfortable cruising the boulevard or taking weekend trips. And it all comes with a price tag that will keep you in the black, too. LOW SEAT HEIGHT: Skimming the pavement at just 25.8 inches, the Phantom’s low seat height makes flat-footing it at stoplights or in parking lots a breeze. And the Phantom’s narrow seat/tank junction makes it feel even lower. FRONT-DISC BRAKE: If there’s one place you don’t want retro performance, it’s your brakes. That’s why we gave the Shadow Phantom a 296mm front disc for distinctly modern stopping power. Curb - 549 lb. Includes all standard equipment, required fluids and full tank of fuel ready to ride. Front Travel - 4.6 in. Rear Travel - 3.5 in.